The start of the 2006 summer movie season is going to be a big one. Most of this month's releases are sure to be huge box office successes. The mix includes quite a few proven franchises including Mission: Impossible and the X-Men. Let's move on to my top ten for May 2006. Proven Franchise #1. This month's top three films should easily going to end up in the top 10 for 2006 (Poseidon may even sneak in there). The opening number for this release should be phenomenal. In addition, this film's being released on Memorial Day weekend so it'll get an extra "weekend" day on Monday. The films in the X-Men franchise have been released fairly close together so the fans are being retained from one movie to the next. It looks like the studio went all out for this one, knowing they'll easily make up their expenditures once the movie is in theaters. This series just gets better with each film, appealing to the core fans (both from the movies alone as well as comic book fans). 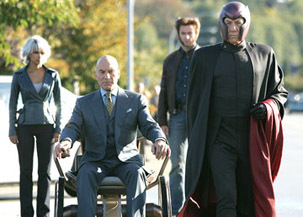 Everything's going exactly as it should with the X-Men movies. Proven Franchise #2. I don't think that Tom Cruise's antics will be that much of a turn-off for people to see this film. The only thing I'm worried about is that the other two films in the series were released quite a while ago and people won't remember what happened. But I guess there will be a boost in video rentals and sales so the public can refresh their memories. As expected, this movie has been featured in every media outlet available to draw attention to the upcoming release and I'm sure the publicity blitz will pay off. The highly anticipated feature film version of Dan Brown's wildly successful novel is finally here. And who better to play the leading role than Tom Hanks? French film star Audrey Tautou will finally be exposed to a larger viewing public as well. This movie could finally launch her to stardom here in the United States. This film has had a lot of built-in publicity. Ever since The Da Vinci Code came out, people have been arguing about the various theories about religion, particularly Jesus' marital and familial status, brought up in the book. The studio has let the public do its own word-of-mouth advertising without having to sink a lot into advertising. Of course, the studio isn't stupid and they will keep putting commercials out. However, with the controversy surrounding the film, the public's interest should be peaked and they'll come out the see what the fuss is all about. The Poseidon Adventure was one of the non-G rated movies I can remember seeing in the theaters. There is one scene that still creeps me out. I haven't seen the original in a while, but I remember a scene with the survivors finding a guy that was killed when the ship flipped over and his face is all burned up. I think he "fell up" on some hot pipes on the ceiling. If this remake of the 70s disaster flick can make even a little bit of an impression, it should do well. Plus, Kurt Russell is a good person to have in a lead role. He has shown that he can handle a variety of roles, from Disney family entertainment to action adventure. He definitely hasn't let himself get typecast. Let's hope this film can at least pay for its enormous budget. Lindsay Lohan has finally been given a big payday. She's reportedly making $7 million for this movie. With that kind of investment, the studio will put everything its got behind this film. As the saying goes, "you have to spend money to make money". And spend they will. The PG-13 rating may turn away some of Lohan's younger fans, but I don't think it will really deter them that much. This CGI film has got me a little nervous. I hope the studio isn't relying a lot on the public's familiarity with the Over the Hedge comic strip. I really think that comic book movies have a wider audience than comic strips. Plus, the people that read comic strips aren't really the audience that the studio needs to attract. Comic strips have an older audience that doesn't spend their own money as freely as the comic book crowd spends their parents' money. But the CGI aspect should be enough to draw some folks in, even though they don't know anything about the characters.